At this week’s computer-assisted reporting conference in Louisville, IRE has me doing double-duty. In addition to my class on OpenRefine, I’m also teaching a hands-on session on git and Github. This assumes you’ve already downloaded git and created an account on Github. I use the command line, although if you master that, the GUI clients will be a piece of cake. a command line utility to track changes to a file and to share those changes with others. good for any kind of text - stories, csv, html, .js, .py, .rb. In a broad oversimplification, it uses diff to compare every addition and subtraction in your code and shows you how your files evolve. It lets you take snapshots of your code and roll through them over time (or back in time) as needed to follow how a file changes from save to save to save. And you can have several authors of a file branch off their own versions to edit and then later merge them all back together into one master file. 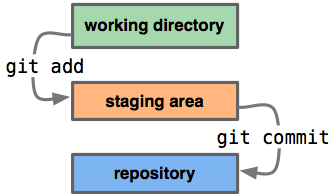 There’s a lot of things going on behind the curtain in git, that you can figure out eventually, but don’t worry about it here. For right now, basically you only need to really know six commands. This will orient you to where you are, what files have changed and whether you’ve saved your snapshot of your project (which we’ll soon start calling a “commit”). This is your friend. Where you work and where you edit your code is the working directory. When you’re ready to take a snapshot of your code, you “add” your file to the staging area. After you’ve made all the changes you want, and you’ve “added” all of your updated files to the staging area, it’s time to make a commit. And with each commit, you want to add a short message describing what the changes are. git commit -m "finally debugged my own idiocy. maybe..."
Now all of your updates are saved in your file respository, and if you want to, you can your snapshot is made. You could very easily stop here and just keep the audit trail on your machine. But the other half of this happy marriage is Github. Github is a social coding site, and it’s a hosted remote repository. It lets you back up all of your code online (for free if it’s open source), and it lets you see how other developers do it and learn from their work. One of the many great things about Github is that you can see the diff in your files without the Matrix hypnosis of command line. The last couple commands I’ll tell you are how you get your commits from the remote repository on Github back on your machine. to gather the updated files from your remote “origin” repository. Now you want to “merge” the changes from the master branch on your remote “origin” repository into your master branch on your machine. Now your files are updated from the remote repository. Now keep coding. If you want more, you can visit the repo for this class, where I have a cheat sheet for the most common basic uses and commands and more in-depth tutorials. This really just deals with the basics. We haven’t even had a chance to talk about merge problems, branching, forking or cloning, but you know how to Google, so you can figure it out. Fork my repo, improve the cheat sheet and send me a pull request. What’s your favorite tip or cheat in git? Leave me a comment. I’d love to read it. Learning to commit to version control was published on February 28, 2013 by Tom Meagher.